The Old House section of The Atwood House Museum is the original house built by Joseph Atwood in 1752. Joseph Atwood was a sea captain and "navigator of unfrequented parts." He moved from Eastham and acquired thirty acres in Chatham, bordering on Stage Harbor and the Mill Pond. According to family records, he built the house in a year when he stayed home from sea. He feared losing his ship while England and France were at war during the reign of George II of England, whose subject he was at the time. 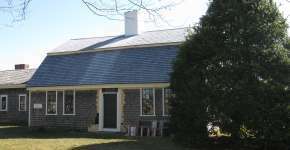 The house is typical of those built on Cape Cod during the eighteenth and nineteenth centuries; it is unusual in that it has a gambrel roof, a type that was rare on the Cape in those early days. Early Cape houses were an adaptation of the English cottages of Cornwall and Devon, the areas from which the first Cape settlers had come.